The geodesic flow on a manifold with negative curvature is ergodic. The lecture note that I'm reading does not provide a reference for that. I am aware that Gromov's proof of Mostow's rigidity theorem doesn't need this result, but I'm working on an assignment and I need to learn about Mostow's original proof. I have some background in Riemannian geometry but I know nothing about ergodic theory. Can anyone give me some reference about this result? All kinds of resources are welcomed. Anosov, D. V. Geodesic flows on closed Riemann manifolds with negative curvature. Proceedings of the Steklov Institute of Mathematics, No. 90 (1967). Translated from the Russian by S. Feder American Mathematical Society, Providence, R.I. 1969 iv+235 pp. This was answered in generality by D.V. Anosov (1967) in his paper Geodesic flows on closed Riemannian manifolds of negative curvature. A free copy is available online, but it is somewhat long and written entirely in Russian. 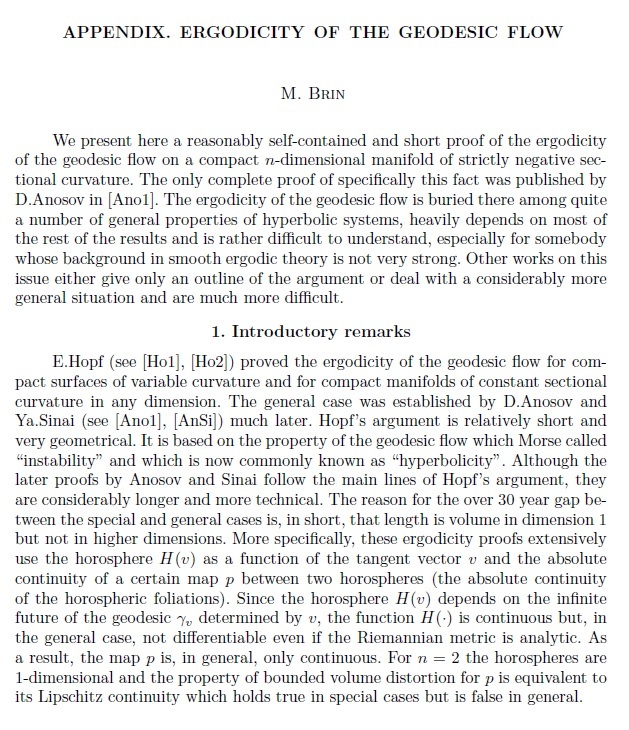 With regard to tracking this down: After learning of earlier results due to Hopf, I searched Google books for "hopf argument" "negative curvature". This led to the book Ergodic Theory and Topological Dynamics of Group Actions on Homogeneous Spaces by M.B. Bekka; the previous link gives a bit of the history of the "study of the geodesic flow on a Riemannian manifold" (p. 79) beginning with work by Hadamard, and followed by Hedlund before Hopf. The general argument is mentioned later on in the same page, and (as Victor Protsak points out) is then referenced as being contained in Ballman's Lectures on Spaces of Nonpositive Curvature. This monograph, available for free here, contains an appendix in which Misha Brin provides a proof in English of Anosov's 1967 result. The appendix begins on page 71 (pdf 73/98); a screen-shot can be found below. Let me write a short scheme of proof that I learned in the course of Ergodic Theory in Warwick University (notes are available on-line. You will find several different versions of this proof). Theorem: The geodesic flow $g_t:X\to X$ is ergodic. Proof: This a classic exercise in Ergodic theory. Proof. Use $g_t$ invariance of the measure $\mu$ and Lemma 1. Remark: The measure $\mu$ is explicit in the Corollary 4 (and omitted in our statement of the Theorem), corresponds to the Liouville measure. Not the answer you're looking for? Browse other questions tagged reference-request dg.differential-geometry riemannian-geometry hyperbolic-geometry ergodic-theory or ask your own question. Do free higher homotopy classes of compact Riemannian manifolds have preferred representatives? Does the Volume Ratio of a Geodesic Ball for a Complete Riemannian Manifold tend to the volume of a Unit Ball in Euclidean $n$-space?